Beautiful view outside the office window this morning. 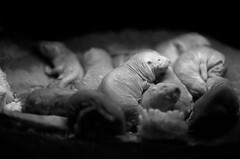 Everyone in the Naked Mole Rat community has a job. There are diggers, farmers, nannies, sentries, and such. They work in shifts, and the members of the pack you see here are between shifts; resting for the day ahead. I’ll bet it seemed like it would be a fun idea when the castmember walked up to this guy at the Backlot Tour and asked asked for volunteers. 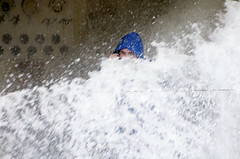 I wonder if he was warned that he may get wet? It’s not too bad though. It’s only 1000 gallons of water crashing down on him. 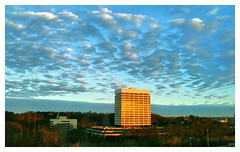 This is a handheld panorama taken from the balcony of our room at Disney’s Wilderness Lodge. The iso is a little high but I wanted to run with a closed aperature. The details are noisier than I would like, but everything is in good focus. I recommend looking at the details by viewing it at the original size. Building circa 1890, Harrison Hightower opened his hotel both as a business and a place to show off the relics he collected during his world travels. It was also the site of his mysterious disappearance. 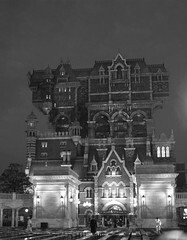 You can read all the details of it’s construction, Hightower’s life, and his end here. Fortunately, when we arrived, the hotel had been reopened for tours. However, we had to use the frieght elevator. This is the view of the Japan Alps from Kawaguchiko (I think) 5th Station on Mt. Fuji. This is the highest point along Mt. Fuji that can be reached by driving, some 2300 meters high. The Japan Alps is the mountain range that runs along the backbone of mainland Japan. Our tour guide also referred to this as the 1000 alps range. It was super cold at this point, even though we were only about 1/2 way up the mountain. The white stuff on the trees in the foreground is snow. This is a hand-held panorama consisting of 27 individual captures. The full size image in PS format is 1.2 gb. This had to be scaled down for upload to flickr. 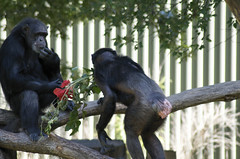 In a display of human-like behavior, two gorillas share a tender moment with a gift of flowers. A few moments after this shot, both of them sat on the log and dined on the bouquet. Having overshot her objective, Ozma makes a sudden course correction during a game of fetch in Atlanta’s Piedmont Park. Ozma is a boxer retriever mix. 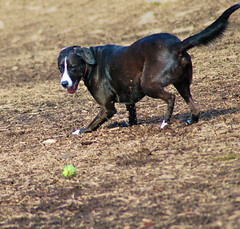 Taken at the Piedmont Park Dog Park. 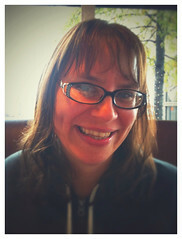 Marie and I decided to take this cold, rainy day and make it fun. So we drove over to one of our new favorite places, Urban Flats. We drank tea, ate salads, and enjoyed each other’s company.